At First Friends, it is our awesome volunteers that make so many of our ministries possible. Volunteering is an excellent way to get plugged in, and to serve God, this church, and the community at large. Please look at the many opportunities below to see where you might fit best. 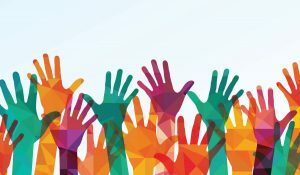 The First Friends Visitation Task Force lives out the “Go” of our mission statement faithfully to those within the Salem community who are unable to get out and fellowship with us regularly. 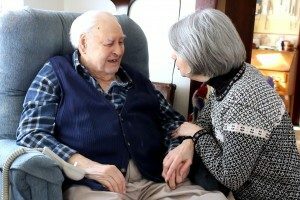 This ministry cares for people of all ages, primarily those who are shut-ins and those recuperating from hospital stays. While visiting, our Visitation Task Force members encourage and pray with those they are visiting. They also bring requested literature from the church such as Our Daily Bread, church bulletins, and special announcements from Sunday worship services. Some Task Force members also make arrangements to share in the Lord’s Supper within individual homes as it is requested by our shut-ins. If you would like to be a part of this important ministry, contact the church office at 330-332-0001. At First Friends Church, saying that we enjoy food is an understatement! As the old saying goes, “We don’t meet unless we eat!” Ok, so that might not be 100% the case, but we DO enjoy fellowshipping around tables for meals. 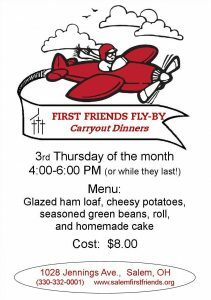 We also have a food-fundraiser once a month called the First Friends Fly-By where we sell meals in Drive-Thru fashion! Additionally, we have a funeral dinner ministry where we provide a meal after funerals to give grieving families an opportunity to eat together, fellowship, and remember. If you enjoy preparing food or serving food, then there are many ways you can get involved! Feel free to call the church office at 330-332-0001 to inquire about any of these opportunities. We would love to have your help! We have a Food Pantry at First Friends Church and distribute food on Tuesdays (9:30am-12:00pm, 4:30pm-7:00pm) to those in Salem who have a short-term need. If you would like to help serve in the food pantry by packing boxes of meals or assisting on distribution days, then please contact the church office at 330-332-0001. We have a vibrant Children’s Ministry at First Friends Church, as well as a growing nursery! 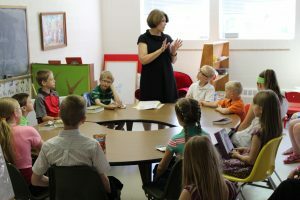 You can learn all about those ministries by going to the Children’s Ministries page. In order to maintain a program like that, many volunteers are needed! If you like working with kids, teaching, or working with toddlers or infants, then there is certainly a place where you can get plugged in to serve at First Friends! Call the church office [330-332-0001] or e-mail Cheryl Woolman [cheryl@firstfriendschurch.org] in order to contact us or get more information. If you are a lover of music, then there are certainly opportunities at First Friends Church for you to use music to worship the Lord and serve this community! Our choir, bell choir, and praise team are a few areas where you can get involved! 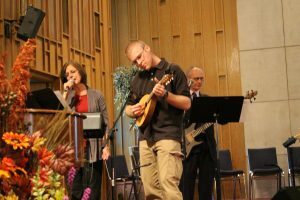 See our Music Ministries Page for more information on those ensembles, and feel free to contact our Director of Music and Worship, Andy Black [andy@salemfirstfriends.org] for more information about getting involved! Do you enjoy working with computers and technology? Are you into photography, videography, sound production, and/or recording? Our tech ministry works with things like these and more on a weekly basis when producing our services! At First Friends Church, we record our services every week, and create DVDs and CDs to be sent to shut-ins. We also stream the audio of the sermon online on our Sermons Page. The video of our service is also streamed on the Salem public access channel (Channel 9) in multiple time-slots each week. 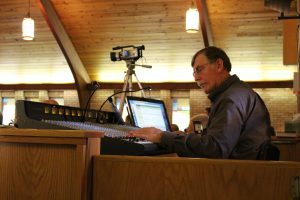 [Note: this now requires a special digital converter box] Our tech ministry consists of several behind-the-scenes roles that constitute a vital part of making each Sunday morning flow smoothly. We are always looking for people to help produce our services and serve in the tech ministry. Please let Andy Black [andy@salemfirstfriends.org] know if you are interested in serving on this team, or even if you would just like some more information. Our Greeters and Ushers are an important piece of our Worship Support Commission. 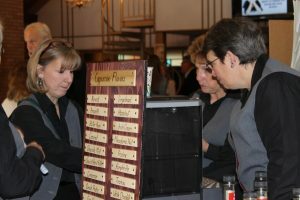 The greeters facilitate entrance into the building with warm welcomes, while the ushers pass out bulletins, take up the offering and stay on hand to assist throughout the service. If you are interested in helping in either of these areas, contact the church office at 330-332-0001. Coffee Fellowship is another piece of the Worship Support Commission, and another important one at that! Every week, there is some sort of snack or breakfast item available to all attenders, prepared by a volunteer (or volunteers) on a rotating basis. There are also coffee, tea, and delicious cappuccinos available every Sunday! If you like to bake or provide snacks, then this might be a way in which you would enjoy serving! Contact the church office at 330-332-0001 for more information.